NDI is an open-standard protocol developed by NewTek for connecting multiple devices via IP network infrastructure and sharing video, audio and metadata with low latency. It uses (highly) variable bit-rate video compression to minimise network bandwidth, when possible, yet maintain high video quality. There is now a group page on Facebook called "ZEN NDI Software" - just ask to join. Image files can be drag&dropped onto the preview window to output them as an NDI source, with an optional background, either solid black, 2-colour graduated fill, transparent, or user-supplied (by frame grabbing the current output). Different scaling modes are available for the source images, which can include an optional crossfade transition when loaded. Images are centred on the output and maintain their original aspect ratio in all modes. A "Watch" mode will reload the current image file whenever it is modified. Image formats supported include bmp, gif, png & tif files, at up to 32bit/pixel (i.e. including transparency). 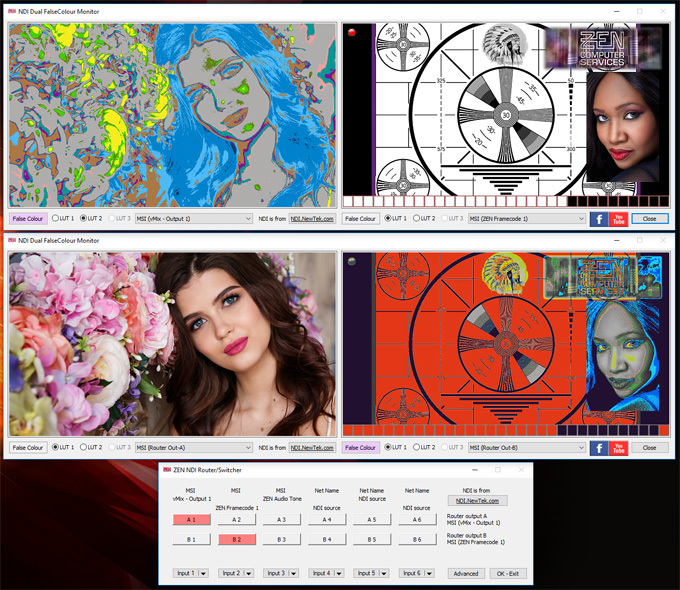 See the video of the Image Viewer in action on the "ZEN NDI Software" Facebook group page. The basic functionality is in generating a 4-way gradient-filled image using selectable colours for the four corners of the rectangle, although pairs can be set to the same value in order to achieve a simple 2-way gradient. The gradient image can either remain static or the colours can rotate in a clockwise (CW) or anticlockwise (CCW) direction. A slider control adjusts the period between colour changes (i.e. faster rotational speed as the slider moves to the right). The gradient image can either fill the screen, be horizontally (H-Split) or vertically mirrored (V-Split) as two half-size rectangles, or be mirrored both horizontally and vertically (in Quad mode) using quarter-size rectangles. The Cloud overlay option adds a fixed fractal noise pattern, self-keyed over the background. On exit, a "last.gbg" file will be created with the current group of five presets, plus it's possible to save a "default.gbg" file from the main right-click drop-down menu in the title bar. If the default file exists, it will be loaded on start-up. Click the "Load last" button to load the last used preset group. Multiple instances of the app can be run on the same PC, with the NDI ident names being sequentially auto-numbered. The "watermark" logo will disappear after several minutes of use. The NDI "Bug Player" is intended for the playback of image sequences (with transparency) as an NDI source using RGB+Alpha video encoding. Typically it can take small images and position them within a bigger canvas, preserving the pixel dimensions of the source images within the NDI output (i.e. with no degradation from image scaling). Sequences can be played in various modes (forward/reverse/oscillate), in either one-shot, continuous or timed play/pause modes. See the video in the ZEN NDI Software group page on Facebook to see BugPlayer in use. One of the "features" of NewTek's NDI (prior to the introduction of Multicast capabilities) is that connections between devices are all point-to-point, such that if two receiving devices are connected to a single source sending video, then two streams are required - meaning twice the bandwidth of a single stream. The more connections you add, the more bandwidth is required. Given that NDI is intended for production environments rather than mass-audience video streaming, this is not usually a problem, but it may be desirable for a number of remote stations to be able to monitor a single source - the main output from a switcher, for example. In these circumstances there could be a high bandwidth requirement over the network connection from that source, potentially more than a single node can handle. One solution is to retransmit the NDI stream from another PC on the network via the equivalent of a "Relay" or "Repeater" transmitter (as used in TV/Radio transmission). A kind of NDI "Distribution Amp" if you like. 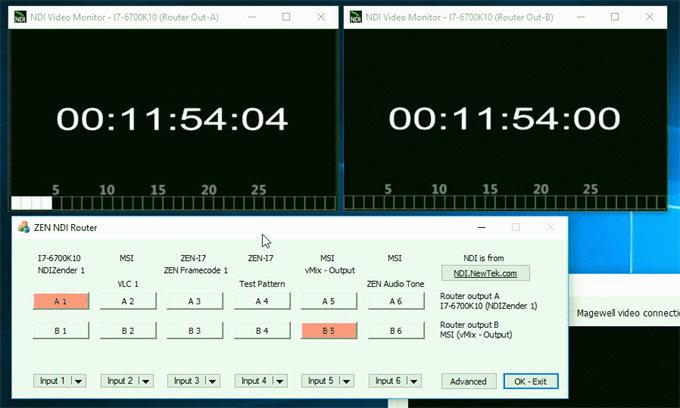 My NDI-RTx was created because I wanted something to run on a remote PC to perform an "NDI loopback" so I could monitor the effects of a round-trip over a network, measured on the same PC as the NDI source. After I started using it I then realised that something like this can be used as a sort of "NDI CDN" to distribute network bandwidth by creating remote "splitter-nodes" at various locations and offload work from the switcher PC. Bear in mind that this utility was created for in-house testing so may not be the most robust code, and given that it was intended for simple loopback applications it has not been tested with large numbers of clients, but if anyone out there would like to do some tests with it you can download a test version below. Unzip into it's own folder and install the VisualC libraries (DLLs) if needed and it should be good to go. Hopefully, usage is fairly straightforward and there's a ReadMe file in the download with further notes. After you open the app it should start to detect active NDI source names. Sources will subsequently be added/removed automatically and are accessed via the drop-down menu above the preview monitor.. Note that "Exclude local sources" is ticked by default. Click on a Source in the drop-down list to make a connection. You will see some stats about the connected source along the top of the window:- IP address/port, Source name, video resolution/frame-rate, audio channels/sample-rate and timcode (if present). The right-hand indicator light will be purple for a video+audio source, red for video-only, blue for audio-only. All but the earliest versions include an audio meter/monitor function (for Ch1+2), as above. Click on the upper/middle/lower part of the speaker icon to get full-level/dimmed/muted audio output. This software is supplied "as-is", with no warranty or guarantees of being fit for any particular purpose! A simple Red-Amber-Green audio display designed to a provide an alert when the audio level of the selected NDI audio stream falls below a certain level. Detection thresholds can be adjusted and the No Audio state both flashes red and generates audio beeps. Also detects of breaks in the stream from the selected NDI source. 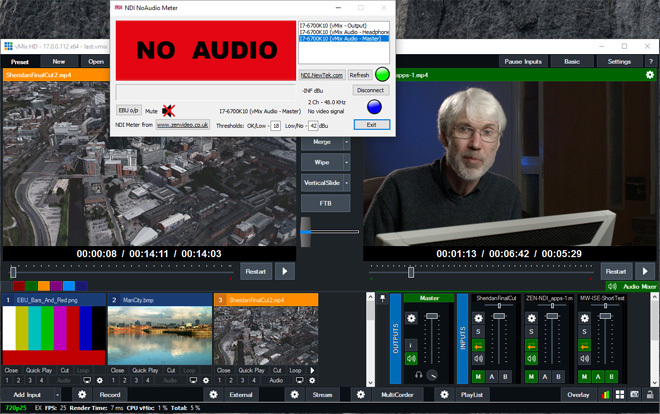 Revised version 1.2.0.x now includes a video preview window and has a number of ways to generate "no audio" alerts, including control of USB relays and via NDI. Functionality is otherwise similar to the previous version, albeit with a rearranged layout to the controls, as shown below. 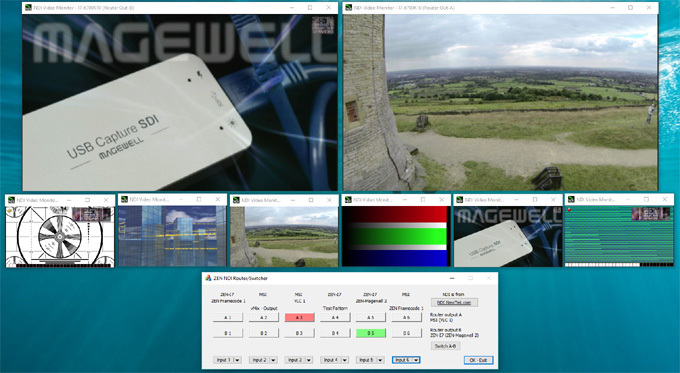 An alternative to NewTek's NDI Connect (Pro), explicitly designed to expose the hardware video processing features of Magewell's Pro Capture family of PCIe cards. 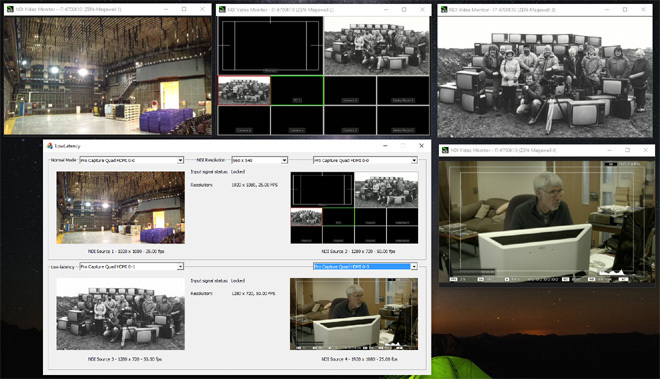 Use a Pro Capture Quad card to create four NDI sources, for example. This particular project is on hold. 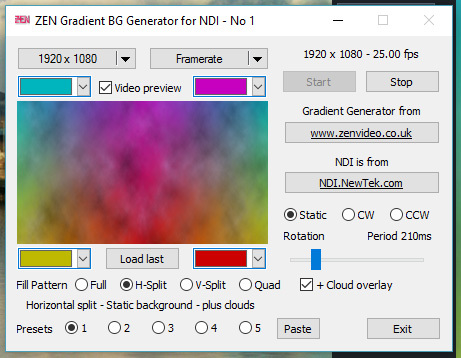 NDIZender is based on the NDI Sender example application that was introduced into the Magewell Pro Capture SDK for Windows at the start of September 2016. Prior to that I'd been developing the quad-input "NDI sender" (above), but in many ways the SDK example looked more complete - it had audio input & monitoring for example - so I thought I'd take a bit of time out and see if I could tidy it up and add a few important features, like support for PAL frame-rates, all of which looked simple enough. Over two months later, after much "tidying up", some debugging of underlying functionality, and the addition of many new controls and features, NDIZender bears only a passing resemblance to the original version in the Magewell SDK. During the 2016 Christmas break I was experimenting with the Routing functions introduced in v2.0 of the NDI SDK. These functions allow the creation of software routers for NDI signals which can effectively switch between NDI sources with no added latency and virtually zero CPU usage. As a proof-of-concept sample application I created a 6-in-2-out switcher - which seems to work as expected and, for some applications, if only as an auxiliary switcher, could be a really useful tool for some people. Note that the switching can be done from anywhere on the network, and that the actual NDI streams do not have to pass through the computer running the Router software, which effectively just acts a "front panel remote" to the virtual NDI router. During the summer of 2018 the Router has had something of a makeover. The new version (from v1.2) can be configured on start-up to have anywhere from 6 to 20 inputs and from 2 to 24 outputs. Routing Preset buttons store groups of switch positions, allowing multiple outputs to be switched with one button click. Config files can be saved and loaded, including "save last used on exit" and "load last used on start-up" options. Config files include the data for Routing Presets and for the NDI sources used by each input. Multiple copies of the Router can be run, as long as each is allocated a different "base name" for the outputs, which can be done at start-up and is saved in the config file. In the illustration below, the earlier version of the router/switcher is configured like a 6-input cuts-only A-B switcher, with Preview (B) & Program (A) buses/outputs and a Cut button which swaps the contents of the busses. 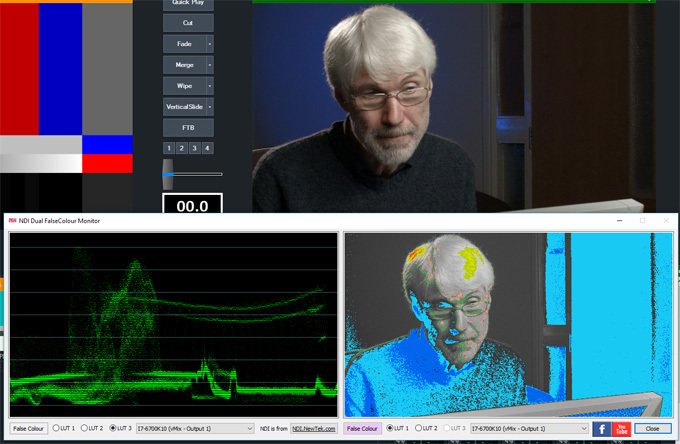 Dual independent NDI video monitors with optional False Colour display mode, selectable from two different LUTs. Supports NDI tally signals. Ideal for use with the NDI Router (above), which would provide the ability to select each of the display inputs from up to six NDI sources, and quickly switch between them.